More than one in six soldiers who served in the country's most recent wars may have post-traumatic stress disorder. That's the finding of the National Health Study for a New Generation of U.S. Veterans, according to the Veterans Health Administration, which sent out an update Wednesday on the study. It's the first study that includes post-9/11 veterans who don't use the VA or who served during the wars but didn't deploy to Iraq and Afghanistan, according to the Veterans Affairs Department. In total, 60,000 veterans participated in the study. "PTSD is a significant public health problem in Operation Enduring Freedom and Operation Iraqi Freedom deployed and non-deployed veterans, and should not be considered an outcome solely related to deployment," the department says on its website. But veterans who were deployed in the country's latest wars are nearly 5 percent more likely to screen positive for PTSD than those who were not deployed. About 15.7 percent of post-9/11 soldiers who were deployed are at risk of developing PTSD, compared with almost 11 percent of those who were not, according to the study. A positive screening by a doctor doesn't automatically mean that a veteran has PTSD, but the VA says it "does indicate that a patient may have PTSD or trauma-related problems." If veterans potentially have PTSD, they are also required to be questioned on if they are having suicidal thoughts, and will likely be referred to receive additional mental health care. Symptoms of PTSD can include suicidal thoughts as well as nightmares, flashbacks, changes in personality, and sleeping disorders. Post-9/11 veterans who use VA health care are significantly more likely to be flagged for PTSD than those who don't, and this study included soldiers from both categories. Among deployed troops, more than 24 percent of those enrolled in the VA got a positive screening for PTSD, compared with 9.8 percent of non-VA users. The VA doesn't elaborate on why there is a gap between the two groups. 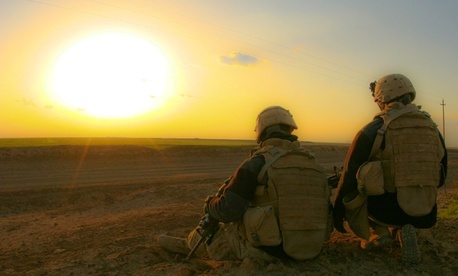 PTSD—and mental health problems more broadly—are considered to be underreported. VA officials and advocates acknowledge that some veterans attach a negative stigma to asking for help. Despite the study, it could be decades before the VA knows the full extent of post-9/11 veterans' health problems. VA Secretary Bob McDonald, speaking at the National Press Club last week, said that "forty years is when the peak demand occurs for a veteran serving in a war. Forty years from the end of the war." Advocates want to extend a veteran's combat eligibility for free VA health care from five to 15 years after they leave the military. In a lesson learned from the Vietnam War, they say that some veterans have a delayed reaction to trauma after they leave the service. An estimated 30 percent of Vietnam veterans suffer from PTSD. Tom Berger, executive director of the Vietnam Veterans of America national health council, saidearlier this year that for Vietnam veterans, the extra time "would have made a world of difference."